Barn swallows are about sparrow size with big shoulders and long tapering wings. Their colors are striking: beautiful cobalt blue wings and back with tawny colors underneath. Their deeply forked tail is the distinguishing identifier of a barn swallow. That forked tail, according to legend, is due to a deity angry when the swallow stole fire from the gods and brought it to the people. The god threw a fire-brand at the swallow which singed away the middle tail feathers. They feed mostly on the wing and swoop low over water, meadow, parks or ballfields looking for insects. They eat all types of flies as well as beetles, wasps, ants, butterflies, and moths. 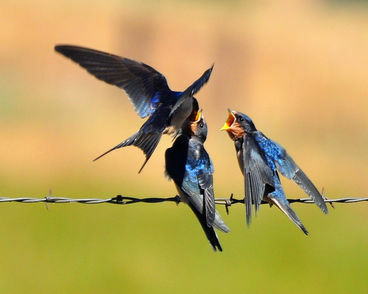 Barn swallows prefer larger insects rather than feasting on lots of small bugs. Grit and small pebbles, or eggshells may help them digest their meal or add calcium to their diet. Barn swallows don’t even stop flying to drink. It’s just a quick dip down to the water to take a mouthful and quench their thirst. Barn swallows are picky about nest locations checking out several sites before deciding on the final location. They build cup-shaped nests on structures, like barns, or bridges, or stables. Before man-made structures were available, barn swallows built their nests in caves. The only site of cave nesting barn swallows that remains is on the Channel Islands off our coast. Both sexes help build the nest of mud mixed with grass stems. They start by building a shelf and then the sides. When built against a vertical service, the nest will be semi-circular. But if built on top of a horizontal service, they will build a perfect cup. The cup is lined with grass and then soft feathers. If they re-use a nest, they clean it out first and add fresh mud to the rim. Males vigorously defend the territory around the nest. They will chase other males, grab them with their feet and tumble to the ground. Barn swallows also mob hawks, gull or grackles that approach nests. To attract them to your yard, put out ground up egg shells or oyster shells. If you have an old out building not used for other purposes and you have a ready source of mud, an open door may invite them inside to build a nest. Watch your mud puddles for barn swallow activity. They will pick up mud and grass to use for nesting material. A nest box may also attract them but put it up well before nesting season begins in spring. Fishing line picked up by accident for nesting material can entangle adults or young. Please properly dispose of fishing line, twine and other stringy material to protect these and other birds. The barn swallow sparked a movement. Their gorgeous cobalt blue feathers were used in the millinery trade. George Bird Grinnell’s 1886 Forest and Stream article condemning of the loss of these birds to decorate hats led to the founding of the first Audubon Society. The oldest barn swallow was found in North America was at least 10 years old. It was found and re-released in Maryland during a banding operation.